CareerScope is an annual event that combines an information session with an HTM Alumni Panel and Career Fair. This lively, interactive event brings back some of HTM's best and brightest to tell their stories and give career advice to current students. It also provides important information for interested non-HTM students or students just starting the HTM major. The event culminates with a career fair that includes many of our elite industry partners who are eager to offer both internships and full-time positions. Over 40 industry heavyweights such as Marriott, Hilton, Hyatt, Cvent, MGM, and Great American Restaurants attend the Destinations in HTM Career Event. 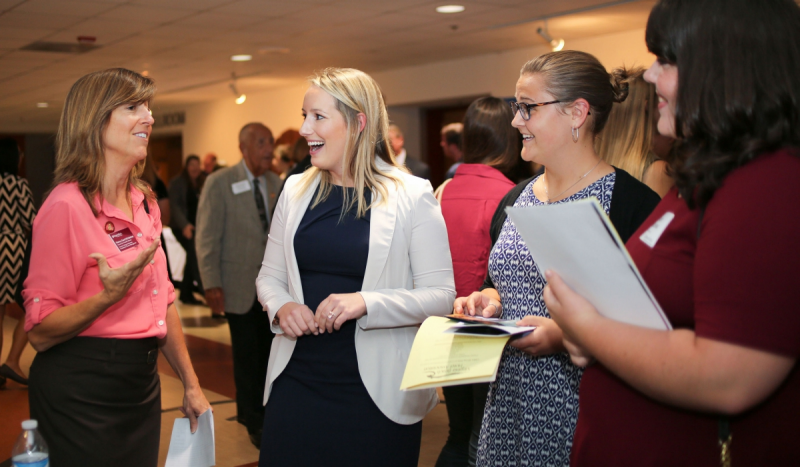 Students have the opportunity to meet and speak with recruiters in the hopspitality industry, share their resumes, and gain valuable knowledge about the hospitality industry and potential employers. In addition to CareerScope and Destinations, we also participate in the Pamplin College Business Horizons Career Fair. Check out this video from our most recent Destinations Career Fair! To get the latest information on internships and job postings, follow us on Facebook and find us on Linked In. You may also be interested in the University Career Services website. "HTM Hokies are not afraid to roll up their sleeves and get to work!" "When I hire an HTM grad from Virginia Tech, I know I can put them right to work and they will get the job done!" These are just a few examples of the positive feedback we receive from our industry recruiters. Our students’ foundation in the Pamplin College of Business gives them the tools they need to be able to contribute to their companies starting day one. In a recent survey, our industry partners reinforced our position as one of the premier HTM programs in the world. Whether they are attending our Destinations Career Fair, contacting us with job postings, conducting individualized information sessions, speaking in our classes, or interviewing, recruiters love our students. The feeling is of course mutual! We also work with our industry partners to build mutually beneficial relationships through sponsorships, opportunities, and our HTM Advisory Board. This synergy helps us to continue to create excellence in the Business of Hospitality and Tourism Management and is a large reason why our graduates enjoy an 85-90% placement rate upon graduation. Contact us at htmdpt@vt.edu or 540-231-5515 if you are interested in learning more.